E-Bikes Ship Free Worldwide. We Make Home Deliveries in Panama. Lensun ETFE 160W, 12V Ultralight Folding Solar Panel with MC4 Solar Cables. Allowing you to continue to use electrical items while in Cabins, Tents, Vans, RVs, Boats, Yachts and Sporting Events. Also Capable of Charging Your Android, IPhones, IPad and Other 12V Devices, Laptops, Tablets, Kindles, Speakers, Electric Bikes, Electric Motorcycles and Chargers Via USB and DC Outputs. Great For Travelers and Bloggers. Connect Items Directly To The Panels or Connect to A Battery To Store Your Energy To Use Later When There Is No Sun. Works well with MPPT controllers, inverters, batteries and also with the Lensun Portable Solar Generators, found here on TheSolPatch.com - all sold separately. 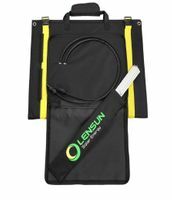 Lensun 160W has 4 lightweight photovoltaic panels of 40W each that are 12V, with MC4 Connector only 4.2kgs/ 9.3 lbs. 1. Folds-up to a compact size in its self contained bag. Half the size of normal aluminum frame folding panels. High quality waterproof canvas for weather-resistant outdoor durability. 2. Designed with no metal frames or glass. Durable, Ultra-lightweight, Only 4.2kgs, 1/5 of normal aluminium frame, folding solar panels. 4. Made with latest technology ETFE laminating. The regularly uneven surface, produced by special processing, can absorb more light, therefore generating more energy. 5. Four eyelets for mounting option, Innovative Adjustable Leg Support, keep the panel at optimum angle to get maximum performance. 6. Portable folding solar panel kits aren't new, but the performance and design of these off-the-grid power solutions is continually improving. 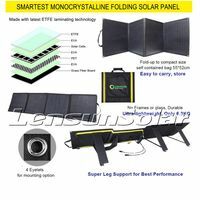 7.Folding Semi-Flexible Solar Panel, 2 x solar cable with MC4 connector on the panel for your own solar controller. 8. It is ideal for outdoor activities such as: Camping, Fishing, Hiking, Biking, Touring, Scouting, Camping Vans, RVS, Motorhomes, Caravans, Boat and Yachts. Net. Weight: 4.2kgs/ 9.3 lbs.